Gokulam of Shri Uwassaggaharam of Parshwa Tirth spreads the beauty of bhakti. Cow family of Gokulam pay regards to lord Parshwa before sunrise. This cow family they themselves come out without any prior instructions given by anyone, they take blessings by taking round of whole temple. Everyday a cow does abhishek from its own milk on the feet of Lord Parshwa infront of the main temple, this process is been running since last twenty-five years.This heritage of Gokulam giveup their food and water totally and are engaged in lord’s bhakti from sun set to sun rise. Maharashtra’s Chief Justice of High Court Shri Shah came very early morning from Nagpura to Tirth on Chatra Poonam, He was astonished to see the cow family in the area of main temple but when he came to know about the reality he gave regards to this family. It is no wonder if living beings are enjoing due to lords divine environment created from bhakti in tirth. Weather is in its full aroma throughout year and green trees gives good health which is sourrended by the tirth area. Such good environment is even enjoined by animals along with humans. Bhaktiras get more deep when cuckoo sings on mango tree it deepens our spirituality when we hear her sweet voice. Birds has made their beautiful nests on the trees of varshi tap guest house which is on main road. Visitors are attracted by the architecture of nests,one can easily watch here goat grants, cow family’s whisper voice and other animals activities. The main important facilities which includes in tirthodhar of this tirth are residence, food and resting place beside as it is knowledge gain centre, place of worship for several devotees. From the idols of the temple’s Sunkul of Gokulam milk is provided for Pakshall, Ghee for Akhand Joyti and Milk for visitors. 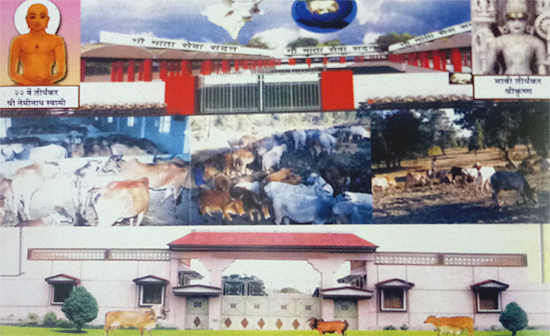 Facilities of fodder and water is very good. Feeble and stray animals are also provided shelter here. On the occasion of anniversary of sun 2060 Pratishta Gokulam Vistar Yojna was started under the guidance of Tirthodhar Prarika pu. Sadhvi Shri Manohar shri ji ma.sa. etc thane. Facility of animal checkups were made in large scale along with the other facilities which are provided in Gokulam. Bhakti and animal care combines to fill enthusiasm. This forest of loving nature give equal pleasure to all. The divine environment of this tirth gives peace, love and devotion.